So as part of spawning life, I feel a need to complete certain projects around the house. There are many -- oh, so very many -- on my list. I'll probably post about those as they get completed. 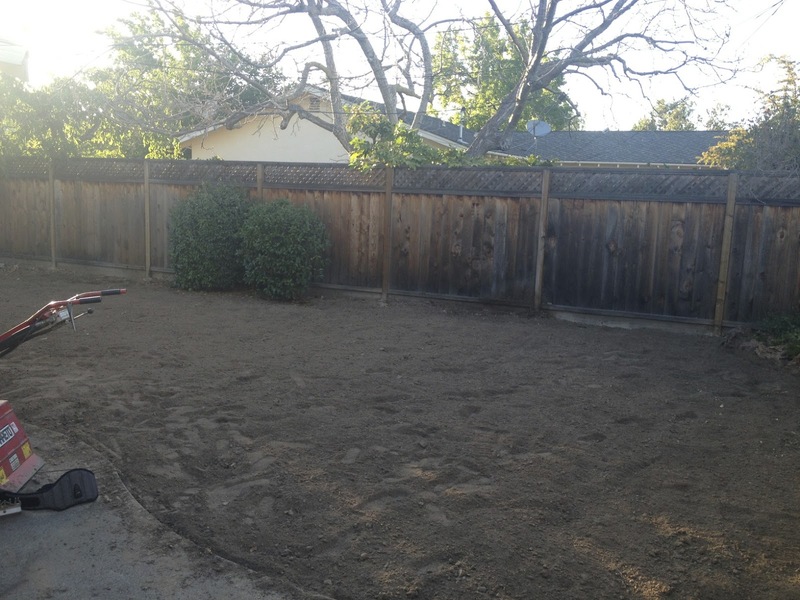 Currently we're redoing our yard. Well, our gardener Oscar is redoing our yard. Some time ago, the previous homeowner installed their own sprinkler system, and suffice to say it was super jacked. As many of their home improvement projects have proven to be. Nay, all. Not a single one was done correctly. Some day I will show you my beige guest bathroom. Everything that isn't brass is beige. Everything. So our sprinklers sprayed pretty much everywhere except on the lawn. There was no irrigation for the border plants, which began to die because Hello, Black Thumb over here. And the sprinklers that did exist were not automatic, so then of course Black Thumb proceeded to kill the small patches of lawn that actually did get sprinkler coverage. And then one of the valves broke, and long story short IT ALL HAD TO GO. So now Oscar is taking care of that bizzle. He's torn out both lawns, rototilled, and torn out lots of border plants. 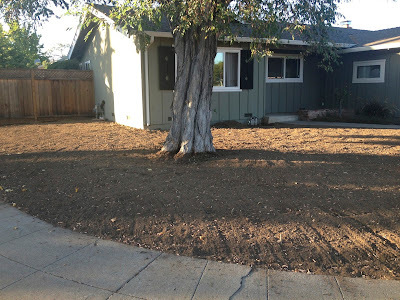 Next up, he'll install bendaboard (which is a real thing and is exactly what it sounds like), then new sprinklers and bubblers, compost, sod, and new border plants. Which is where I need help. I have pretty much no idea what to plant. Help? Pictures below show the areas that will need filling in. Ok. The backyard. That corner area with the weird birdbath -- the birdbath needs to go bye-bye and then I was thinking of putting a small Japanese maple there. There are no trees in the backyard. We used to get shade from the walnut tree in the neighbor's yard but as you can see, it's super-dead and has been for a few years. Two of those bushes on the right that look all hacked up have been removed, but the three rosebushes (one out of frame) are staying. No idea what to put in place of the bushes that were removed. More backyard. Almost all of the plants along the fence were removed except for the jasmine and a camellia bush (at least I think that's what it is.). No idea what to fill it in with. Front yard. 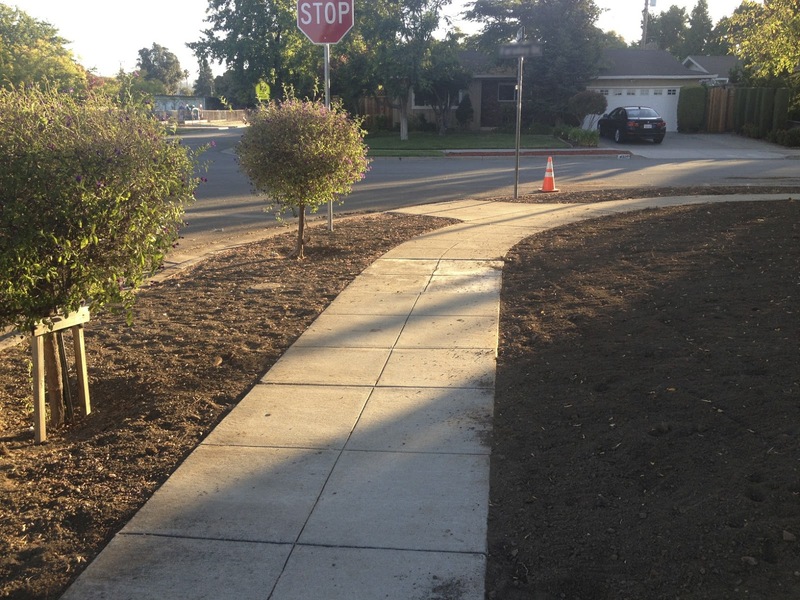 We had the aggregate concrete along the sidewalk removed and plan to install sod. You can see we're on a corner. I'd kind of like to put in some kind of grouping of plants in that corner area to create a buffer, but no idea what kind. Front yard. 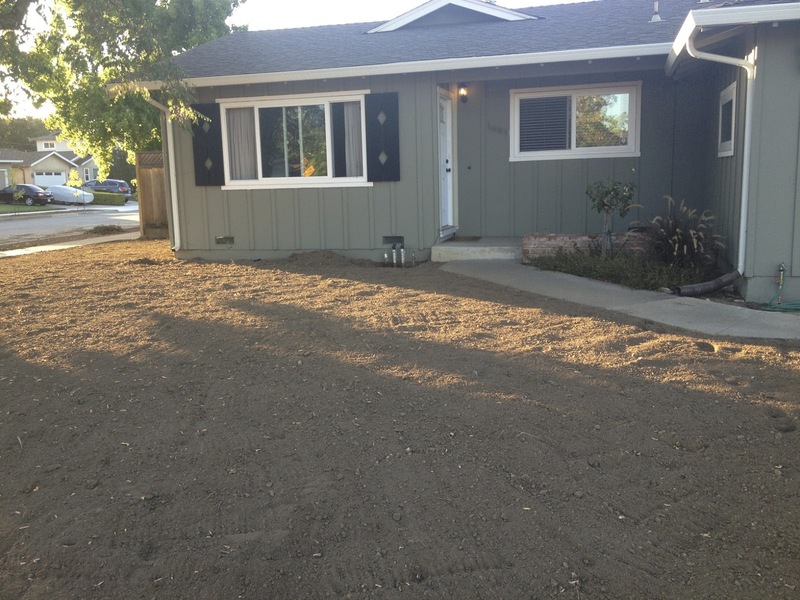 I need to figure out what border plants will look nice near the house. That little corner area that still has plants is going to get revamped, too. And you can kind of see in that same area there's a brick planter box that needs some sort of plants in it. Border plants will sweep across the front and over to the side of the house and then also along the fence. Tell me if this is a crazy idea -- bougainvillea climbing up a trellis on the side of the house? I know it's super thorny and grows like a weed, but I love how bright and hardy it is. Help me, plant people! You're my only hope! Dude. I know sh*t about plants and gardening but good on you for undertaking (ur...supervising?) a massive project pre-baby. Maybe you should enlist a landscaper/designer? 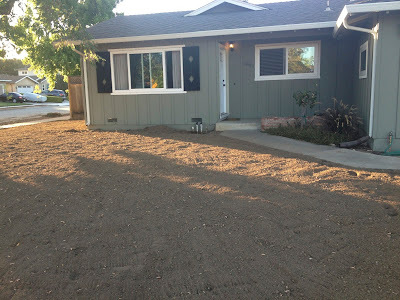 Yay for house makeover blog posts!! Good idea ... perhaps I will do that! I hope Ellie reads this and provides you some insight, because the very idea of this post overwhelmed me. I have a very long list of reasons I'm only suited to apartment living that included taking care of plants before but now has choosing plants, too. Who knew that was even a thing people do? I thought bees just pollinated all lawns to perfection. 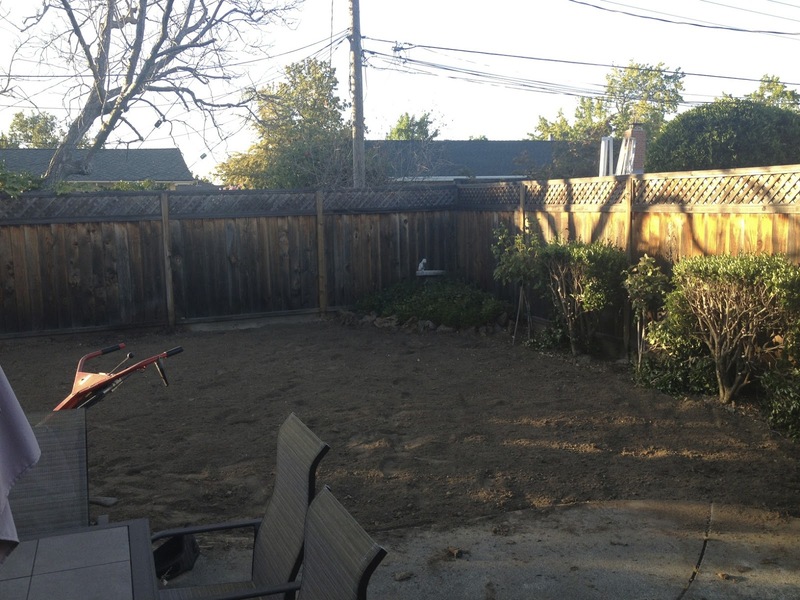 It's a little ridiculous that I own this much square footage of "green" space. It's WAY more than we need. I bet there are entire Pinterest pages dedicated to this. I have no idea. I had a book about gardening once and that's about the extent of my landscaping knowledge! Good luck! It's exciting and terrifying to think of starting from a blank slate. Oh, there are. But it ends up being an exercise in frustration. You find a pic you like, click on it, it dead-ends at the pic, or you get to the page and it's just a photo and no description of what the plants are. I suppose I should consult my gardening books! Blergh.